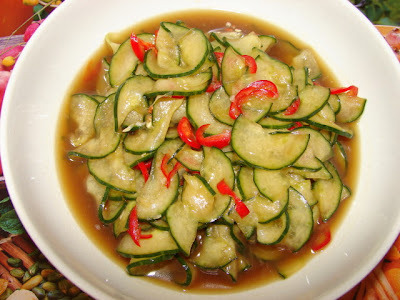 I make this cucumber pickle quite often, it's easy, quick and very tasty. Goes well with any grilled meat, roast chicken or on its own as a side dish. Cut a large cucumber into half lengthwise, remove the soft core and cut into very thin slices. Mix with about 1 tsp salt and leave it for a while and drain off the liquid. Then make the pickling mix with 1/2 lemon juice, 1 tbsp of Chingkiang black vinegar, 1 - 2 tbsp light soy to taste, enough sugar to taste, 1 chopped garlic clove, 1 red chilli sliced and a little sesame oil. Mix with cucumber and leave to absorb the flavour for about 20 minutes. Ready to eat. Nice with a sprinkling of toasted sesame seeds too. If you like a mixed vegetable pickle you can add radish (common radish), mooli or carrot. The thicker cut the vegetable the longer you need to pickle the vegetable. There may be quite a bit of picking juice. It's very tasty to use as dressing for other salad or use it as a sweet and sour sauce.